When it comes to a high performing all-terrain vehicle, Polaris is a name to beat on today's market. With a focus on power and stability without compromising on the fun, this manufacturer has built a legacy as well as a legion of fans with their innovative models. We are pleased to bring you an array of high-quality Polaris ATV accessories to outfit your favorite wheels with something extra. 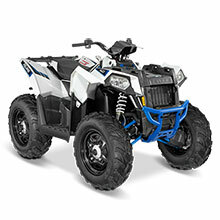 We offer one of the largest selections of Polaris ATV accessories to meet your needs with ease. Focusing on supplying you with the best in terms of performance and quality, we offer top brands for all the essentials and extras you could possibly need. Best of all, we cover a wide range of years and models to make sure you get exactly what your vehicle needs. Whether looking for something for your ACE, Sportsman, or Scrambler, our selection of Polaris ATV accessories has everything you need for all the most popular models and years. When it comes to the variety of products available, you will find options covering every aspect of your model. Whether looking for new lights, an upgraded audio system, folding side mirrors, or plows to add some extra functionality to your model, we are confident you will find something for your need with our expansive selection of Polaris ATV accessories. Whether looking for something to add some extra fun like decals or flags, or something to add extra storage like racks or bags, we have it all in one place for your convenience. We offer only the best in quality and performance to match the specifications of your model, so you can buy with confidence. Add something new and exciting to your favorite wheels today. We are your source for everything your vehicle could possibly need. With a focus on high-quality solutions and affordable prices, we are confident you will find the right accessories. Please contact us with any questions while shopping for further assistance.